When you research Jack Kirby . . . Nothing long and exciting today, but as I was doing my modest amount of research for my Jack Kirby story yesterday, I found some pretty terrific stuff that it just didn’t seem right to keep to myself. 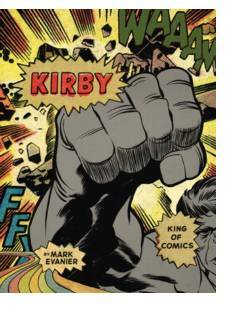 This over-sized book is called Kirby: King of Comics and it is written by Mark Evanier. Mark was once a Kirby assistant, but he is also one of the most knowledgeable jack-of-all-trades running around the comics and entertainment business. Mark is the regular collaborator with Sergio Aragones on Groo and also the late, lamented Malibu’s Mighty Magnor. His credits are far too many to mention here (yep, DNAgents, too). This book is truly amazing and I got my autographed copy from Mr. Evanier himself at the 2008 Wizard World Los Angeles. A must-have item for any self-respecting comics bookshelf.